The city of Bangkok is known as Krung Thep to those who reside here, and its ceremonial name is the longest in the world. The number of attractions the city is home to is almost as extensive as its full name, leaving many visitors overwhelmed when trying to decide which ones they should head for. 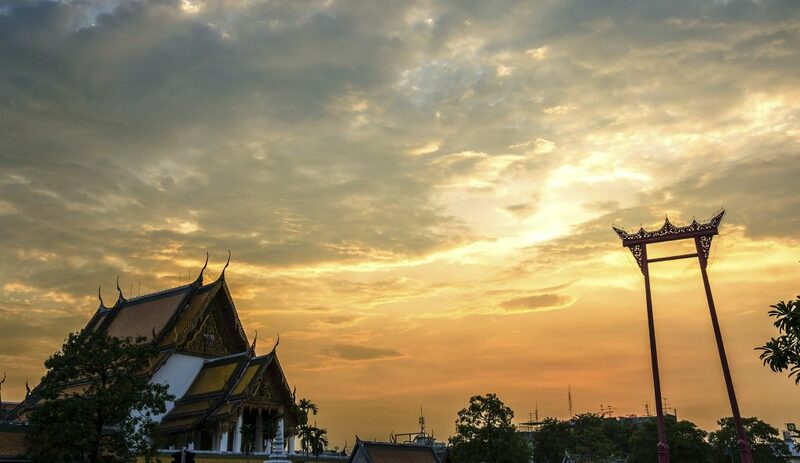 Fret not, as we are here with the top 20 must-visit attractions in Bangkok. 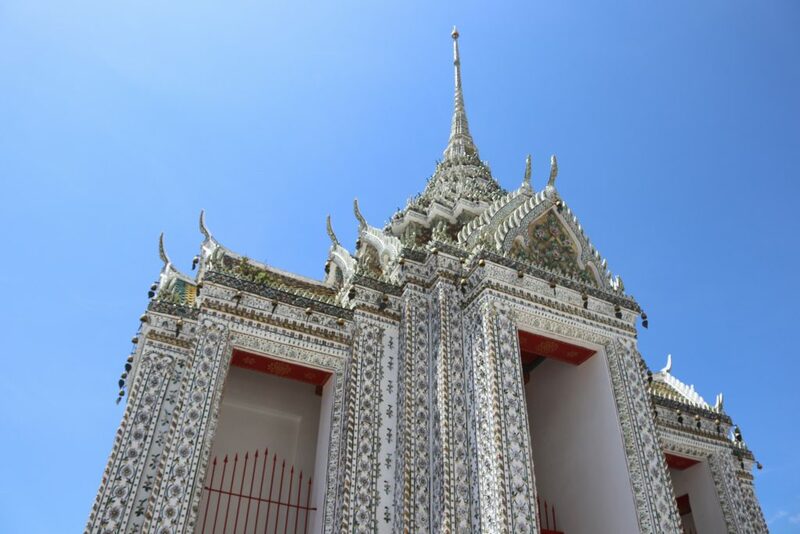 No attraction is more likely to take visitors’ breathe away than the Grand Palace. Visitors kill two birds with one stone by visiting these historical grounds, as this is where the shimmering Wat Phra Kaew is also found. The white exterior walls keep the relics hidden from the public up until the moment they enter. Upon paying the ฿500 entrance fee, visitors will behold an abundance of traditional Thai architecture making up the majority of buildings found on the grounds, of which there are more than 100. Some areas were greatly inspired by the European renaissance era, which visitors may catch glimpses of as they explore the three main zones which make up the Grand Palace. Coming in at a whopping 2.5 kilometers in length, the trail at Lumphini Park may be too long for visitors to tackle in one go. That said, this park provides visitors with a number of things to see and do. In addition to jogging or cycling the path, the park is home to a number of sporadic aerobic classes that visitors can jump in on. Paddle boats can be rented by those who want to take to the water for the day and slowly explore the lake which sits at the park’s core. 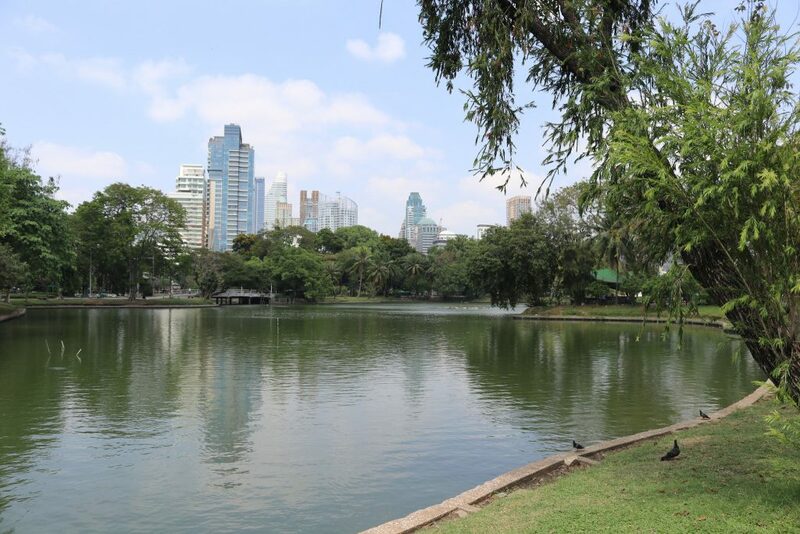 Chinese-inspired gazebos, sunbathing monitor lizards, a concert in the park; visitors never know what they are going to stumble on upon visiting this massive green space in the heart of the city. 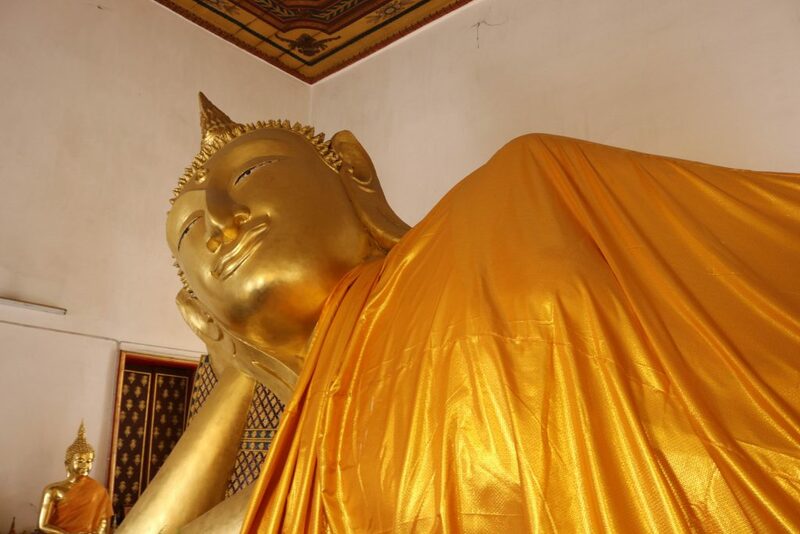 Wat Pho, or the Temple of the Reclining Buddha, is known for the giant Buddha that sits at its core. The religious image is massive, coming in at 46 meters in length and 15 meters tall. The temple, however, is equipped with so much more to see besides this huge sculpture, even if it is the focal point of the temple grounds. In addition to the Buddha, visitors will find colorful murals illustrating over 400 images of Buddha. 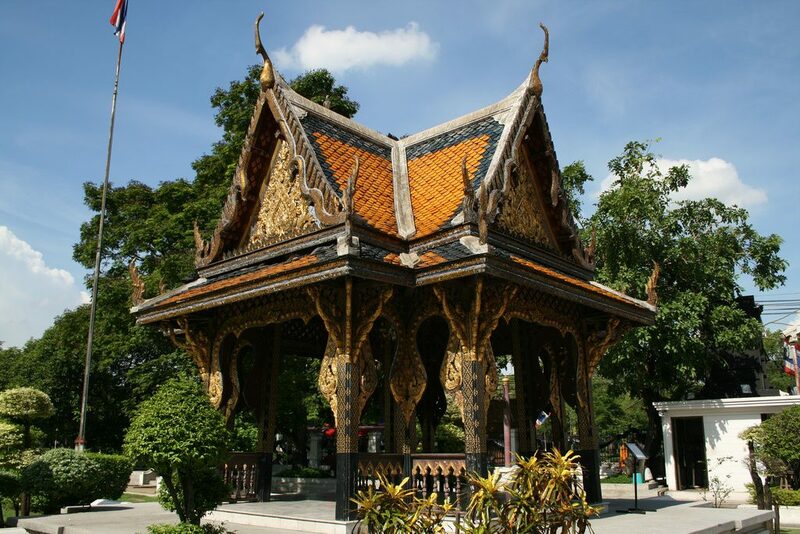 Also on the grounds are notable chedis, a colorful Chinese pavilion, and a traditional Thai massage school. There is a ฿100 entrance fee. 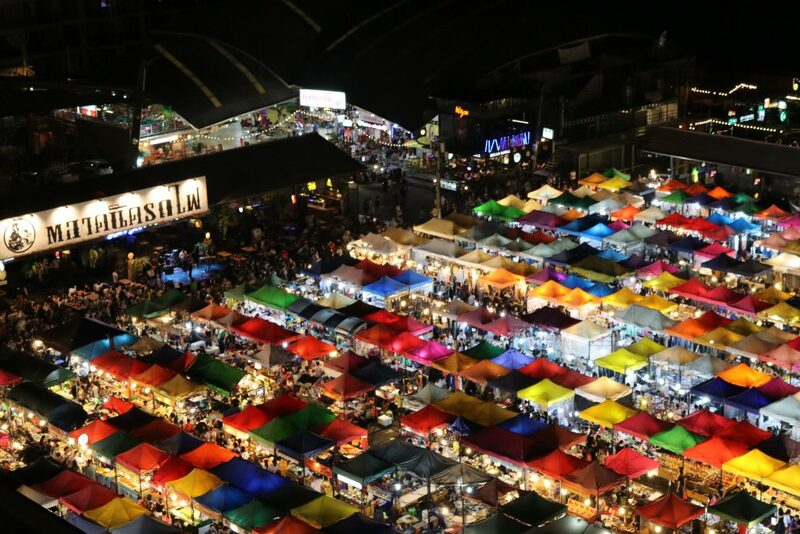 Overwhelming, loud, crowded: these are just a few words that could be used to describe the massive Chatuchak Weekend Market. That said, this is one attraction visitors to Bangkok on the weekends surely cannot miss out on. 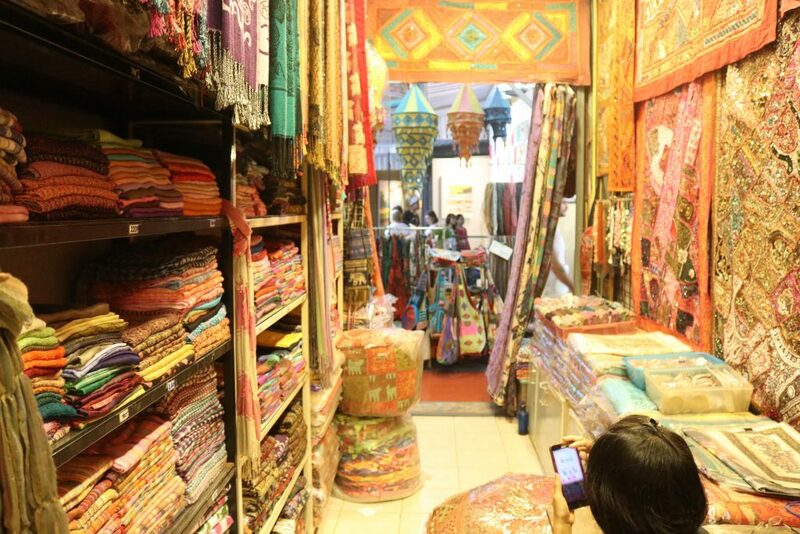 It is one of the largest markets in Asia, and hosts thousands of vendors and stalls to prove it. Rare art pieces, northern handicrafts, genitalia-shaped soap: you name the souvenir, Chatuchak is bound to have it. The best time to visit is in the morning. It is not as hot and vendors are more likely to give shoppers a deal, as the first sale of the day is meant to bring good luck. Be sure to barter, as well. Wat Arun, or the Temple of the Dawn, sits on the western banks of the Chao Phraya River in the old capital of Thonburi. It was given this name by King Taksin, who came upon the structure at dawn. The temple is home to five towering prangs, or towers, which can be seen from the river. These are covered with vibrant porcelain and colorful ceramic tiles, many of which are made to look like pieces of foliage. 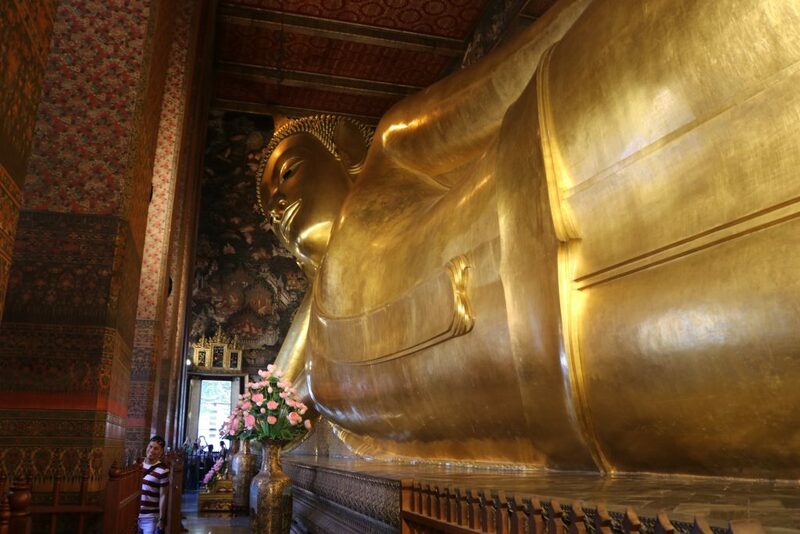 The reclining Buddha found in Wat Pho used to be in Wat Arun. Admission into the temple is ฿50. Sexpats flock to the Kingdom in hopes of parking it at one of the many Red Light Districts in the country, most of which are found in the capital. Bangkok is no stranger to seedy nightlife, but certainly one of the most lively and thriving of districts is Soi Cowboy. Though many visitors frequent the area with every intention of trying out the merchandise, the area also welcomes wide-eyed tourists who just want to get of glimpse of what this road is all about. Prostitution in Thailand has been illegal since 1960, but this does not seem to have slowed these districts down. 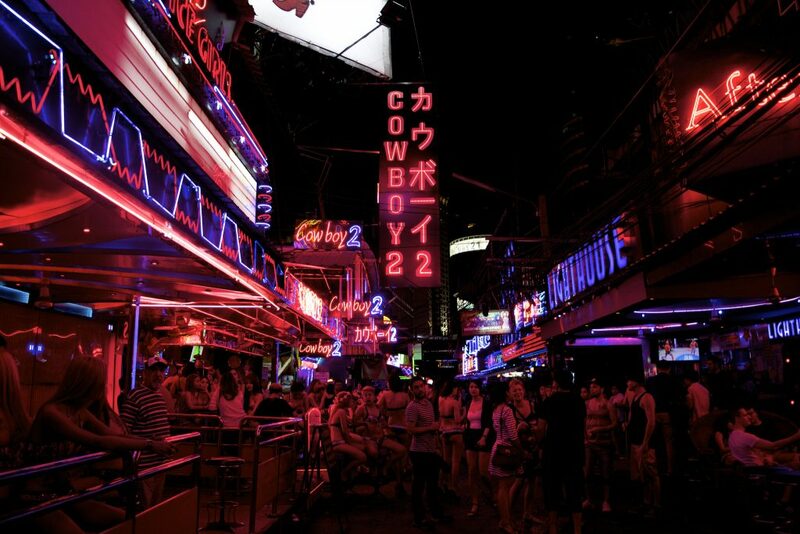 The street that makes up Soi Cowboy is only about 150 meters in length but is chock full of risqué bars, clubs, and more. The street is named after the man who opened up the first bar on the sleazy street in 1970. He was wearing a cowboy hat, and thus Soi Cowboy came to be. One of the newest top attractions on our list, the Bangkok Art and Culture Centre, is a must-see gallery for any of the art-loving travelers out there making their way to Bangkok. The building exudes creativity, and the structure itself is one giant work of art in itself. The building was meticulously designed to provide visitors with an amazing visual experience, as its winding shape is ideal for displaying art. It also has high ceilings intertwined with modern Thai architecture, and each gallery optimizes both natural and controlled light. The Bangkok Art and Culture Centre is also home to a number of cafes, restaurants, an art library, eco-friendly souvenir shops, a prayer room, and more. Construction of the gallery began in 1995, but it was put on hold when a new governor was elected in 2001. Construction began again in 2004. 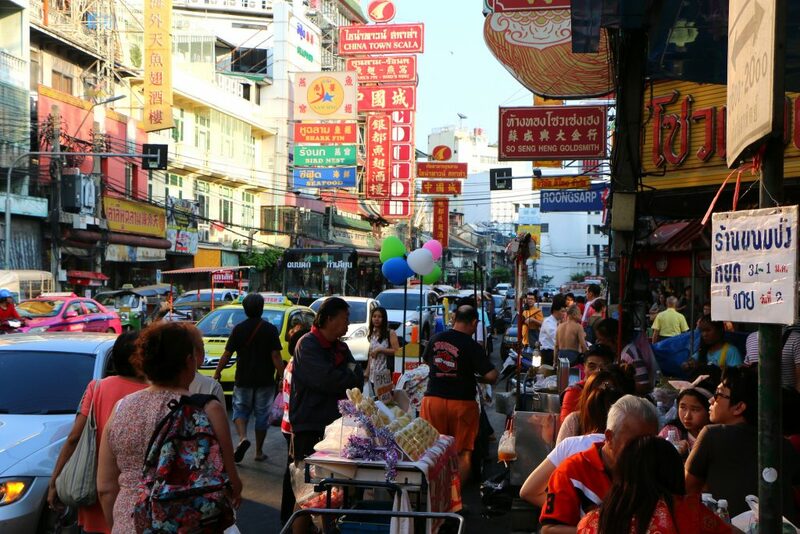 Yaowarat Road is the main street that cuts through Bangkok’s thriving Chinatown. It was built in 1891 and is about 1.5 kilometers in length. It is here visitors will find some of the most delicious street food after the sun goes down – the majority of vendors do not seem to come out with their delicious eats until after dark. If visitors are unsure as to where the best food is, just follow the crowd: where there are many people, there is sure to be delicious food. A large Chinese community has made their homes on the eastern banks of the Chao Phraya River in 1782 but moved to where Yaowarat Road is now after King Rama I relocated the capital. 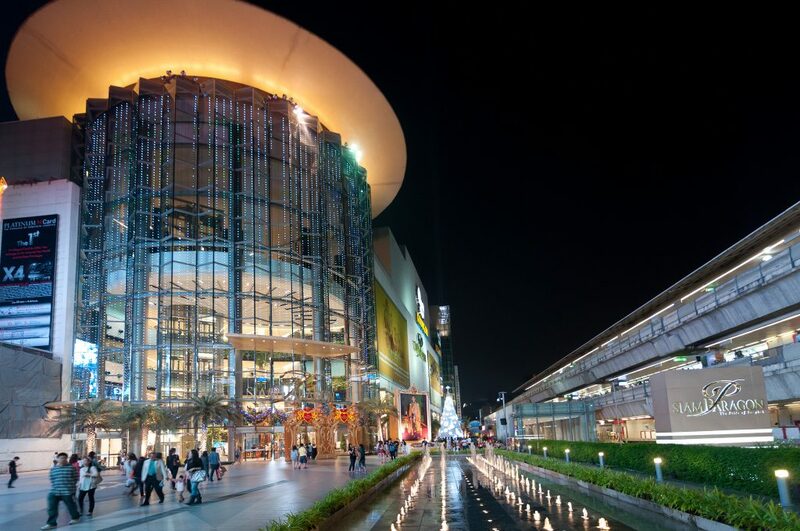 Dust off those credit cards and shine your baht as we head to the next top attraction in Bangkok: Siam Paragon. 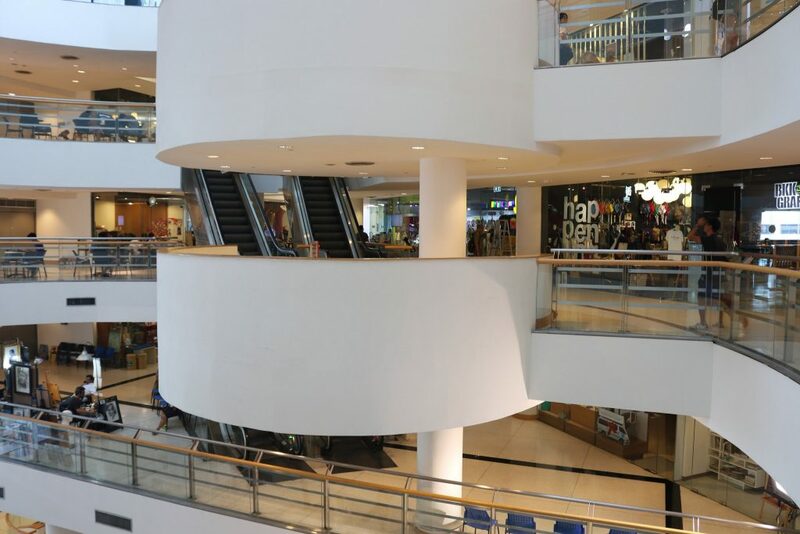 There are a handful of malls that make up the majority of this area, but certainly the most well-known is Siam Paragon. Its recognizable exterior can be seen from the platform of the train, with rising gold pillars in a large glass entryway welcoming shoppers. The mall is chock full of high-end and designer items, with unique finds like an aquarium and a luxurious movie theater also calling this mall home. Siam Paragon hosts new expositions almost every week, so visitors never know what they are going to find at this deluxe, shopping arena. Khao San Road is every backpacker’s haven. Endless bars, street food vendors galore, and some of the cheapest booze in town can be found along this stretch of road. Many budget-friendly accommodation and food options are found here, which is why backpackers tend to flock to this one kilometer stretch. The best time to visit is at night when visitors can grab a vibrant bucket filled with one too many shots of their favorite liquor and watch as the craziness unfolds. 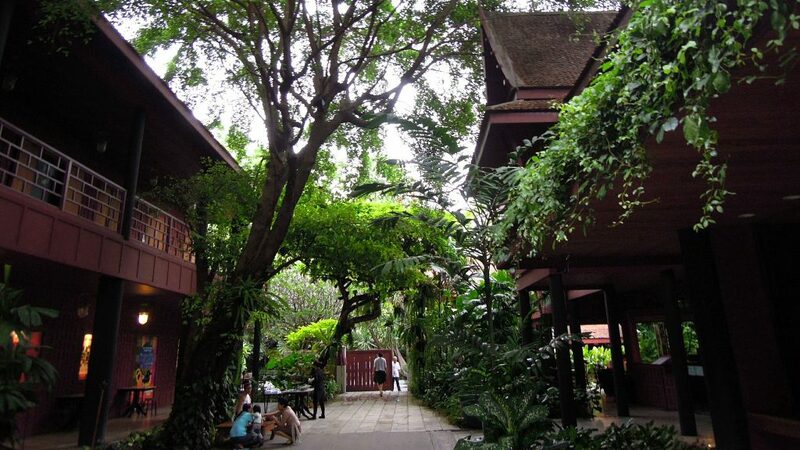 The Jim Thompson House Museum is made up of six traditional Thai teak homes. These homes used to belong to Jim Thompson, an American entrepreneur who made Thai silk famous around the world. He was originally an architect before venturing to the Land of Smiles, and his house is decorated with unique pieces of art he collected around Thailand. Not everyone agreed with how he chose to build his house, which is now one of the top museums in Thailand. His mysterious disappearance in the Cameron Highlands in Malaysia has continued to baffle and intrigue many who visit his home, as visitors will learn about the theories as to why it was he went missing in the first place. Vibrant covered vendors are jammed packed in the area behind the Esplanade Shopping Mall, making up the new train market in Bangkok. It’s original predecessor, though filled with its own unique finds, is hard to reach and leaves many visitors venturing elsewhere to get their market fix while in the capital. Rod Fai Train Market off Ratcadaphisek Road, however, offers the same cool vibe as the original and is easier to get to. Delicious eats, antique souvenirs, hipster clothing, and trendy bars are just a few of the things visitors can expect to find at this unique night bazaar. The Patpong Night Market is certainly the most notorious of all the markets in the capital, with strippers and go-go bars adjacent to the plethora of goods and souvenirs found here. 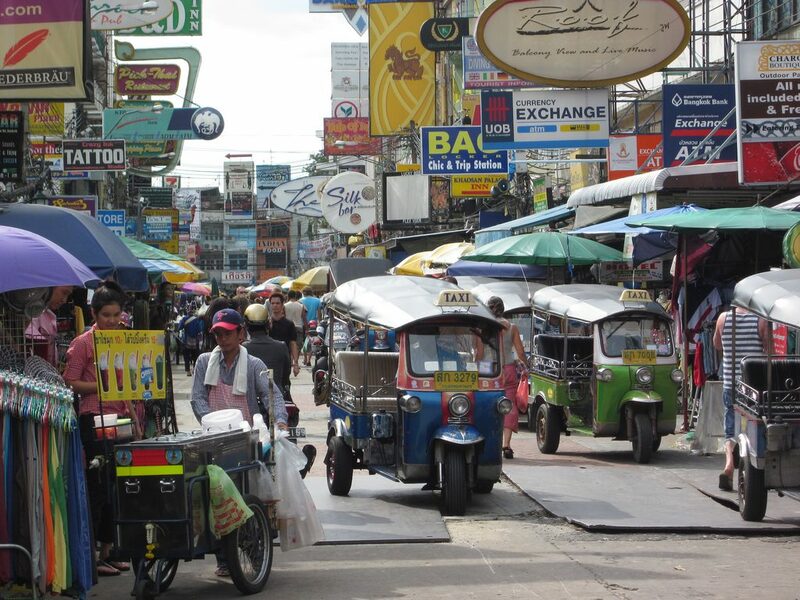 It is one of the most popular markets located in Silom, an area which seems to be threatening Sukhumvit as it attracts more and more visitors and locals alike to its thriving streets. Amid the overabundance of Thai souvenir favorites, like cheap t-shirts and shot glasses, are some seemingly more interesting finds that are not necessarily kid-friendly. Bang Krachao, otherwise known as the green lung of Bangkok, is an island located in the province of Phra Pradaeng. Found just outside of the city, the island lacks any urban trimmings. Equipped with an extensive park, small yet stunning temples, spirit houses, a floating market, and extremely friendly locals, this is one place visitors to the city can venture and truly escape the bustle of the capital. The Bangkok National Museum is one of the most comprehensive and informative ones on all things Thai. From culture to art to history and more, this is a one-stop museum for all things Thailand. It is located near the Grand Palace and was built in 1782. Its original purpose was not that of a museum but a palace for Prince Wang Na. It was later turned into a museum in 1884 by King Rama V. Visitors can admire the Thai architecture or the relics kept inside the stunning structure. There is a ฿200 entrance fee into the museum. 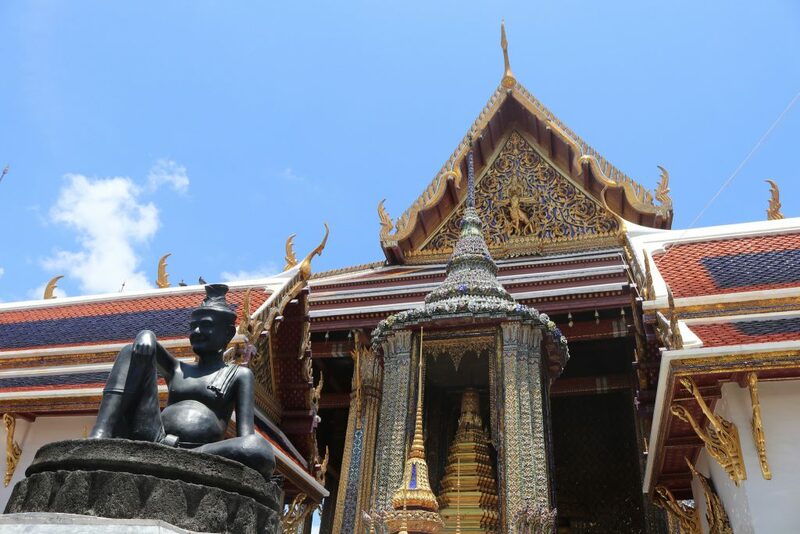 Religious relics can be found along the many streets of Bangkok, and one of the most stunning of them all is the Erawan Shrine. It sits at one of the biggest and busiest intersections in the heart of the city. 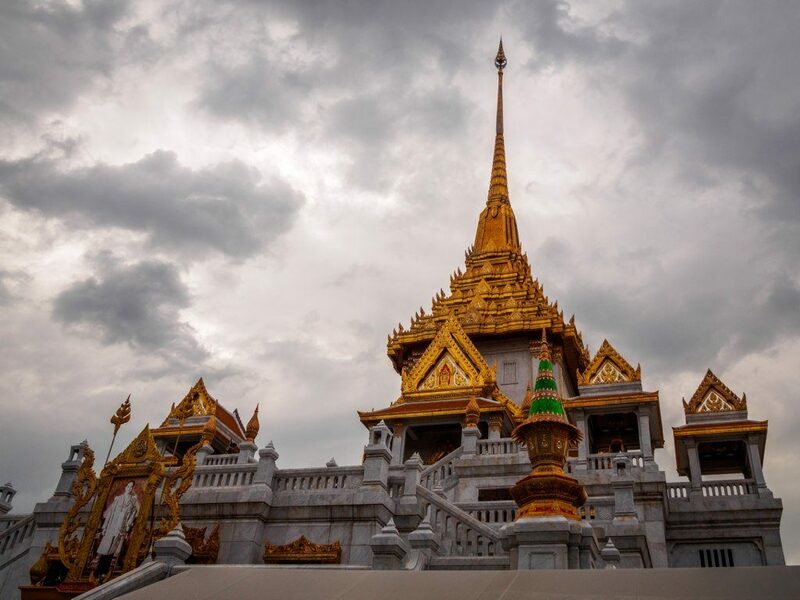 Built in 1956, Thais and tourists alike flock to the shimmering Brahman shrine to take photographs, watch a traditional Thai dance, and more. Located along the murky banks of the Chao Phraya river is Asiatique the Riverfront, one of the trendiest and most unique markets in town. The best way to reach this market is via boat, making the journey here a bit more exciting. 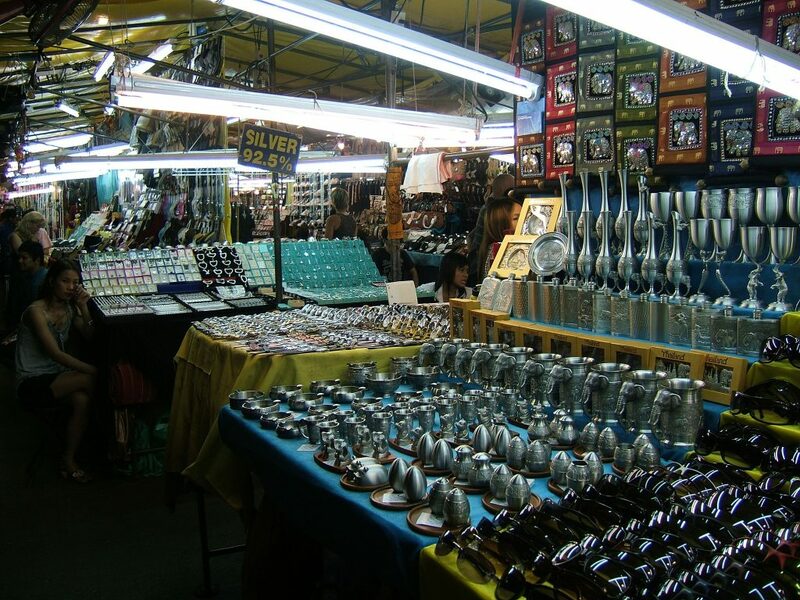 Unlike many of Bangkok’s top markets, visitors will not find counterfeit goods or an overwhelming onslaught of vendors and stalls. This market is cleaner, more organized, and is chock full with fashionable finds. 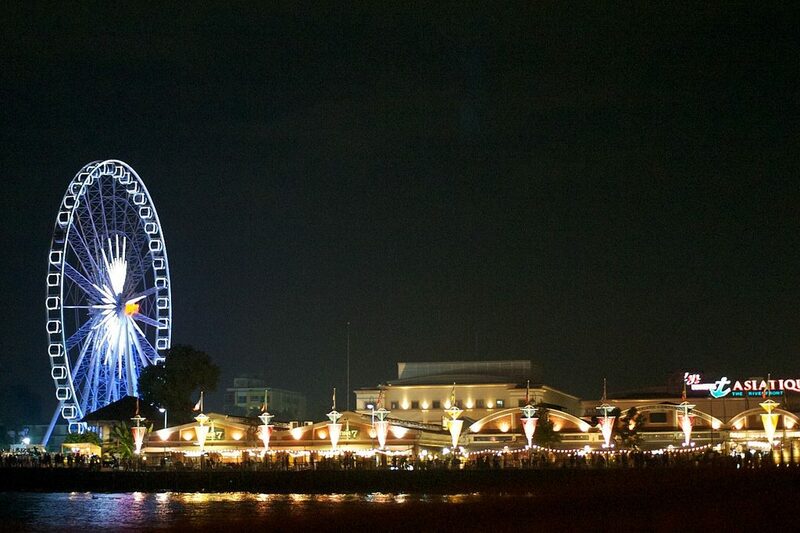 One of the highlights of Asiatique is the 200-foot-tall Ferris wheel. Equipped with 42 gondolas, this is a great way to see the city and river from incredible heights. 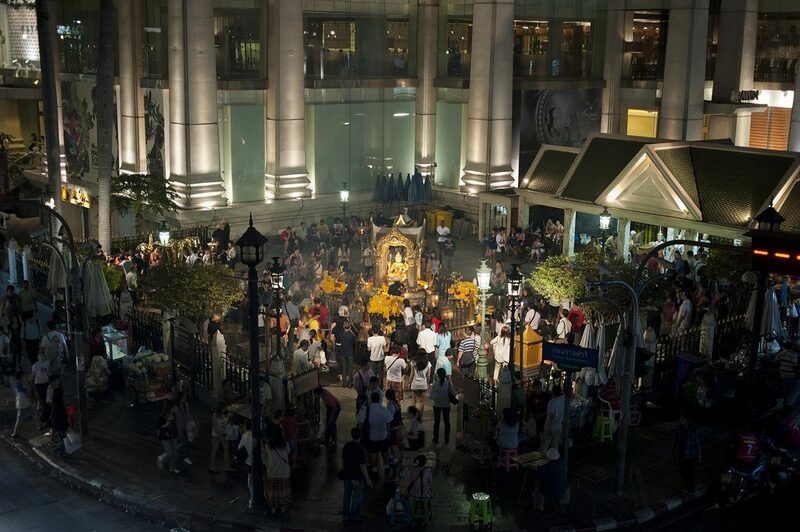 Just a short walk from Yaowarat Road is Wat Traimit, one of the most noteworthy temples in the capital. The stunning building is home to a 5.5 ton Buddha. The Sukhothai-style statue stands at almost 15 feet tall. The Buddha might be worth a fortune, but the entrance fee to see it only costs visitors ฿40. The temple of Wat Suthat is recognizable by many visitors because of the giant red swing that sits just outside its entrance. The swing itself is made of teak wood brought to Bangkok from the province of Phrae, and it has been rebuilt and replaced a number of times. It stands some 21 meters tall, and was used during a Brahman festival in which men flung themselves using the two side poles in hopes of reaching a bag of gold that hung towards the top. The temple is one of the oldest in the city, and construction of the temple began in 1807 but wasn’t completed until about 40 years later. Last but certainly not least among the best and top attractions in Bangkok is the Artist’s House in Thonburi. This unique attraction sits right along the banks of one of Bangkok’s many khlongs (canals). 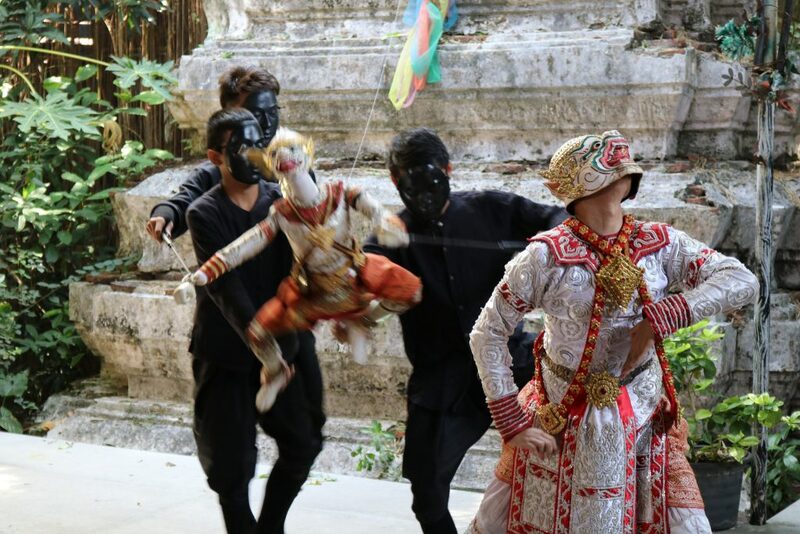 It is a place where creative minds can gather, work, grab a coffee, and watch a traditional Thai puppetry show while they are at it. The Artist’s House is over 200 years old, and it is a great place to spend a quiet afternoon in the otherwise hectic city of Bangkok.